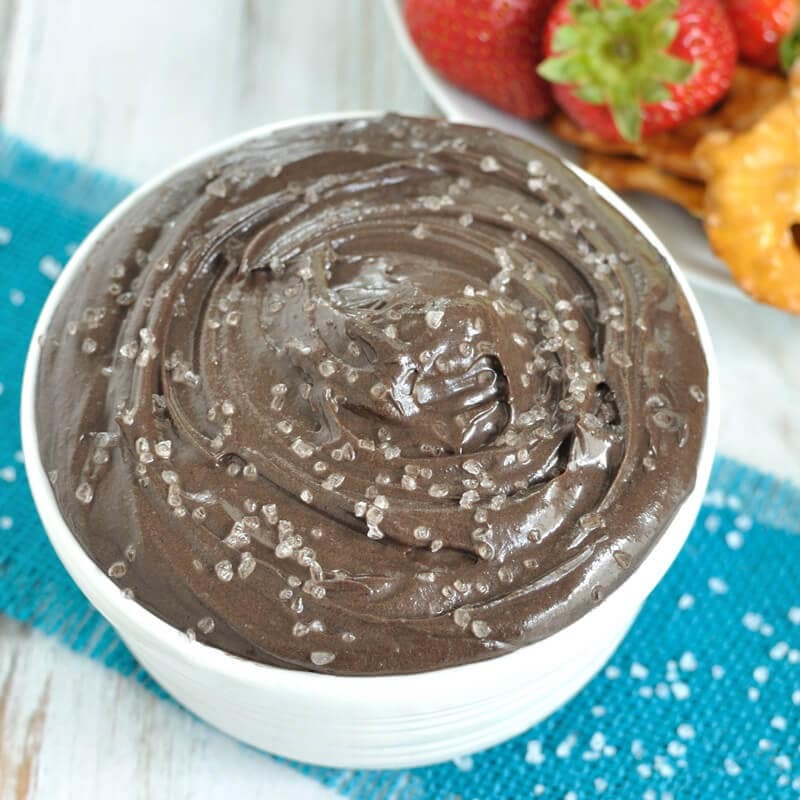 Which do you prefer- dark chocolate or milk chocolate? I’ll choose dark chocolate over milk chocolate anytime. 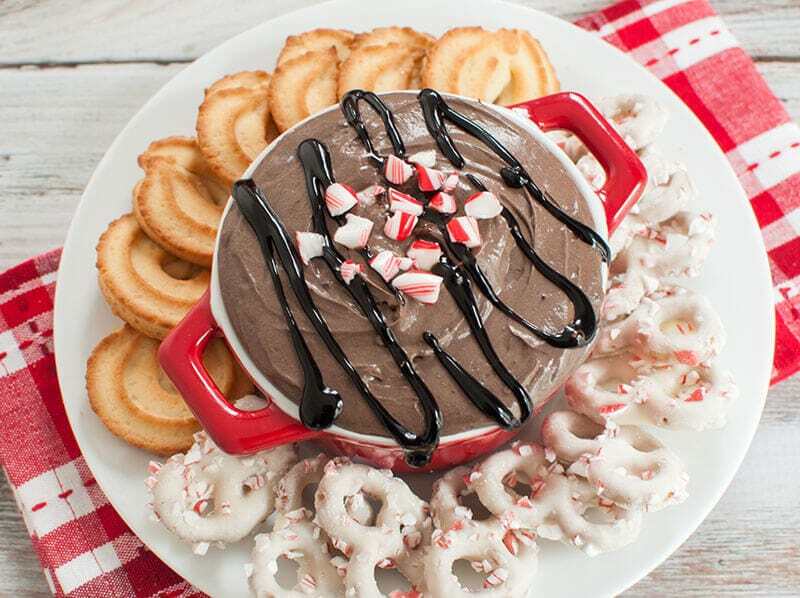 I really love dark chocolate with peppermint this time of year and this dark chocolate peppermint cheesecake dip is sure to please fans of the two flavors. 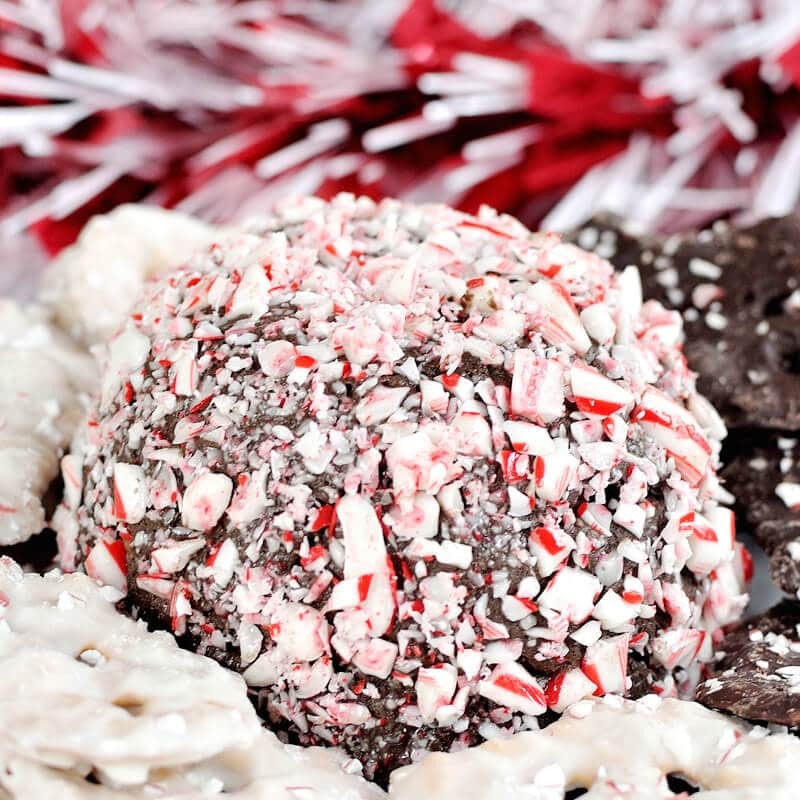 I also used dark chocolate in this peppermint mocha cheesecake cheese ball recipe. While we are talking about choices, let’s talk about Christmas lights for a moment. If you put up Christmas lights, do you do white or color lights? Or both? I grew up with color lights. My mom would not even think of having white lights on her tree. It just wasn’t Christmas without color lights and as a kid, I loved all the colors! I even remember when our window candles had big orange bulbs in them. When I grew up and had a tree of my own, I went with white lights. Some where along the way, I just learned to love the elegant look of white lights. Then I got a house and decided to get a smaller tree for another room and went with blue and white lights on that one. Why stop at just 2 trees though? I have a small tree on my kitchen counter with color lights. Oh and we had to replace our main tree last year (we do artificial…another thing I grew up with) so why choose when you can now get lights that can be white or color with just the press of a button. I keep the white lights on most of the time, but will switch on the color if I’m in the mood for something different. 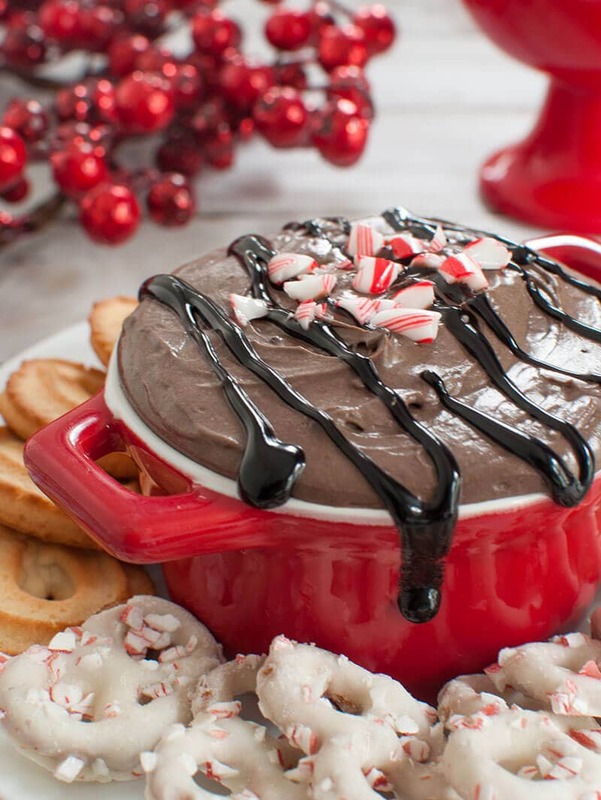 Now let’s talk a bit about this Christmas dip recipe. It’s super convenient for this time of year because it can be made a head of time and left in the fridge until ready to serve. 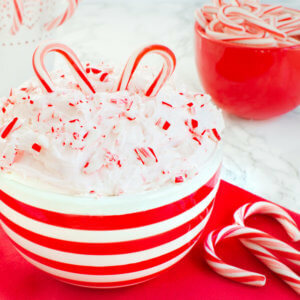 It’s festive topped with crushed peppermint. 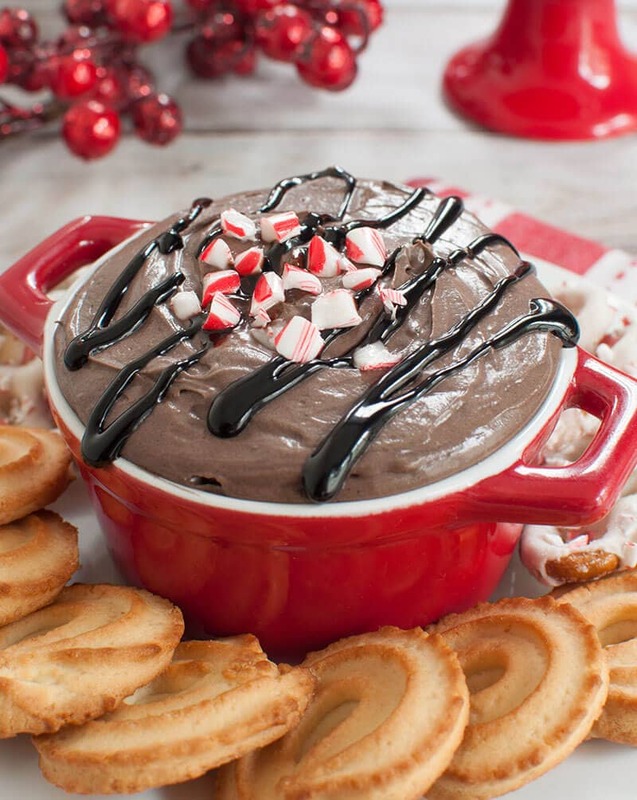 And it’s loaded with peppermint flavor. You have lots of options for dippers to go with this as well. Butter cookies are a great idea as are peppermint pretzels, but graham crackers, your favorite cookies or even fruit would be good too. In a small bowl, beat the whipping cream until stiff peaks form. Set aside. Using a mixer on medium speed, beat the cream cheese until creamy. Slowly add in the powdered sugar and dark cocoa powder and mix until well combined. 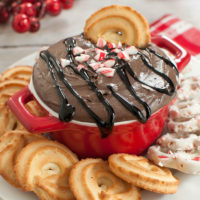 Add in peppermint extract and whipped cream and whip until dip is smooth and fluffy. 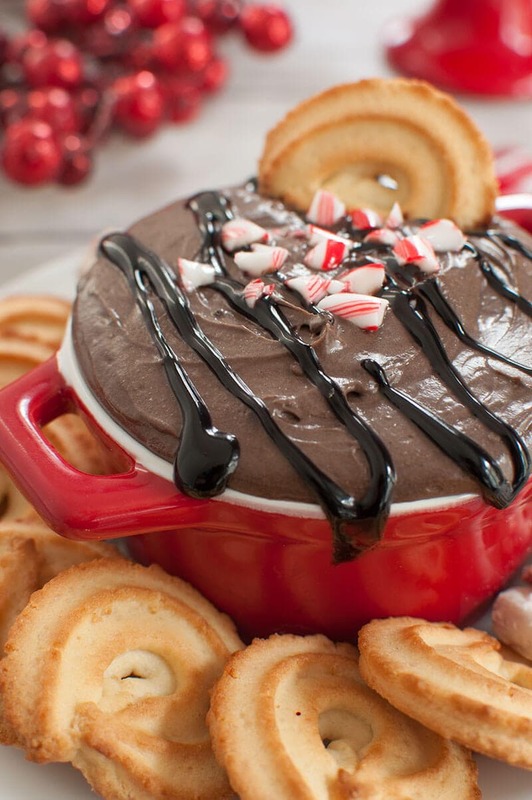 Optionally, drizzle with dark chocolate syrup and/or sprinkle with crushed candy canes before serving.